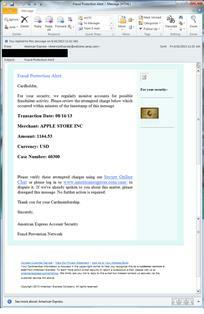 I’m sure most of you have received fraudulent emails like this. Here’s a tip for you for identifying fraudulent emails. If you get a message like this, HOVER the mouse over the link in the e-mail. DO NOT CLICK. You will see where the link will send you if you click. 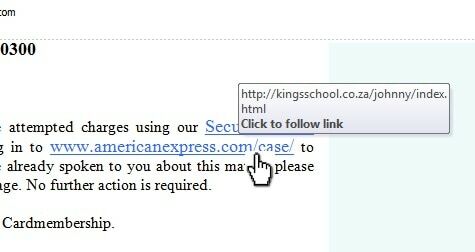 In this case, it would send me to a .co.za domain, which is in South Africa. Don’t click, just delete the message. Of course, the standard advice still applies… Don’t open suspicious e-mails! If you did have an American Express account and you got a fraud alert, you should NOT click the link in the e-mail, but call them. You could also open your browser and log into your account again not using the link in the e-mail.